(CNN) - With a budget deadline just days away and New Jersey facing a billion dollar shortfall, Gov. Chris Christie told a town hall audience on Wednesday that he will veto any bill that crosses his desk containing a tax hike. The Republican governor was greeted with a standing ovation as he entered the gymnasium at an elementary school in Haddon Heights, a suburb of Philadelphia, for his 122nd town hall. Before taking questions, Christie said he will not approve any budget that raises taxes and fees. New Jersey lawmakers are expected to hand the governor a budget bill on Thursday that contains what he called a millionaire's tax - an income tax increase for people earning more than $400,000, as well as a 10% increase in fees for business owners. 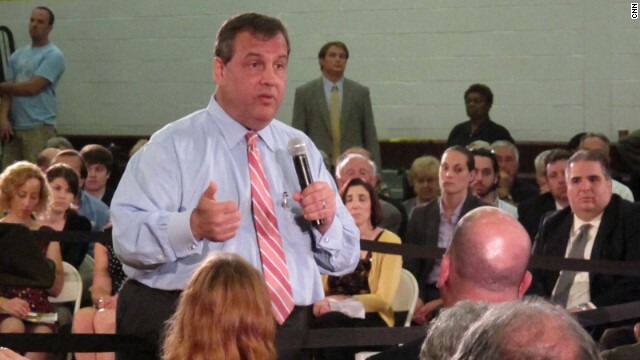 "I believe what we need to do is reduce spending and reform entitlements," Christie said. "They want to raise income taxes to second highest in the country, and pass a 10% surcharge increase on every business that pays corporate taxes." Christie, a possible 2016 presidential contender, argued that such increases would further hurt a state that is already lagging behind the rest of the country in the economic recovery from the recession. He warned that additional tax hikes would cause more people to leave New Jersey when many residents already move away to avoid estate and inheritance taxes. The governor and lawmakers have until July 1 to enact a balanced budget. There was a brief interruption at the town hall when a man stood up and shouted at the governor about New Jersey's medical marijuana act. "Governor Christie, my daughter has been waiting for the MMA for a year and a half. My daughter has been dying and withering away. It's not right. You worry about the future. The only ones that you're worried about is the money and that's about it," said the man. Christie ignored the protestor as police escorted him out of the room without incident. The governor was asked about a variety of topics such as pension reform, education and the Sandy recovery. No one posed any questions about ongoing probes into the lane closures at the George Washington Bridge or the Securities and Exchange Commission's investigation into the funding of a highway rehabilitation project in Jersey City. At question in the latter controversy is whether the use of funds from a Port Authority of New York & New Jersey bond offering on a non-agency property fits the definition of fraud. Christie did not comment on a report from public radio station WNYC on an investigation of phone records that revealed the New Jersey appointed chairman of the Port Authority was in frequent contact with the governor's office during the days that access lanes at the George Washington Bridge were closed and the borough of Fort Lee was crippled by traffic gridlock. The records also showed that chairman David Samson was on the phone regularly with top Christie aides in the aftermath of the lane closures scandal. How typical, rather than report about the about the disastrous economic news and how the most corrupt president in history, the democrat liberals and the media turn their attention to a Republican governor. The IRS scam is coming apart, the Va and it's unions are killing veterans, and the liberally biased media are still demeaning Republicans. Christie said he will not approve any budget that raises taxes and fees. Another read my lips kinda guy ! FREE "Bernie" Madoff HIS INNOCENT ?